I’ll back-up, in November of 2016 I caught a ride up to New York City slept in a church office…a quite comfortable church office and then stood for three hours waiting for my friend Rich Reinhardt to run past me for 20 seconds at the 2016 New York City Marathon. Grabbed a piece of pizza, jumped on a train under Madison Square Garden and headed home. Oh, and I loved every minute of it. Three hours of watching individuals take on one of the great physical challenges of sport was a thrill to me and went by in a flash. 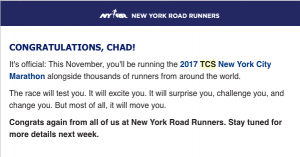 While there at the race, as a lark I decided to enter to run the NYC Marathon in 2017. I say a lark because entering to run this marathon is not like entering other marathons. In 2016 82,172 runners applied to run in NYC only 19,083 were selected, the year before even fewer 14,326 were selected out of more than 80,000 entrants. So when I hit the enter button to submit my registration I said out loud to myself and to the Lord I guess, “God I guess if this is what it is going to take to get me in shape again…” as if I was challenging Him. Since the day I received that email ’till now I’ve been working on choosing a training plan. Reading up on how to avoid injury. Sleeping a little more. Drinking more water. I’ve picked-up my daily activity. But most of all I have felt a fire in my belly for a personal goal I have not felt in years! Over the course of the next 8 months this blog, besides all the other things it exists for, will serve as my running journal. I’m going to tell you all about my running plan, my highs, my lows, my joys, and my sorrows, my motivations and my fears; and hopefully at the end of it all there will be a picture of me toeing a line on Staten Island and a few hours later crossing a line arms uplifted in Central Park. I hope you will join me on this journey, but whether you read along or not, I ask you to PRAY for ME!